It’s a great honor to receive this recognition for the Q-Tag... We faced some stiff competition, and this award is a testament to the innovation delivered by the Q-Tag in a very mature market where genuinely new ideas are rare. ALL-TAG, a manufacturer of U.S. made RF EAS Labels, and a leading supplier of AM and RF Anti-theft Security Tags, Security Labels, and other loss prevention products, was recently awarded “Most Innovative In-Store Solution” of the year for the Q-Tag, at the 2018 Fraud Awards. 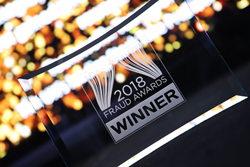 The UK Retail Risk Conference hosted the 2018 Fraud Awards. The event recognized the technological advancements and innovative approach that ALL-TAG’s Q-Tag brings to the market. To qualify for the “Most Innovative In-Store Solution,” the judges looked for innovative approaches to an existing, tried and tested solution or genre. The solution had to be from either a vendor or be an in-house retailer solution. Q-Tag’s size, shape, and the connectivity between the tag and pin make it virtually impossible to remove from retail merchandise forcibly. Q-Tag’s unique stacked 3D RF coil offers superior EAS system detection performance to standard 2D flat RF coils. Retailers no longer need large EAS tags to achieve adequate detection. The patent-pending lock opens by a very unique array magnetic detacher that cannot be purchased anywhere is necessary to release the Q-Tag’s lock. A single Q-Tag can come equipped with 8.2 MHz Radio-Frequency (RF), 58 KHz - Acousto-Magnetic (AM), and Radio-Frequency Identification (RFID) technologies. For retailers with RF, AM, and RFID systems installed in various stores within their chains, they can merely use Q-Tag to accommodate each store regardless of the type of system installed there. No more keeping track of which tags need to be shipped to each individual store. Q-Tag can be used to protect any apparel or soft good because Q-Tag’s specially designed pin will not damage even the most delicate fabrics such as ties, scarfs, and lingerie. With this pin, retailers can tag merchandise wherever they deem most useful from a security and/or customer experience standpoint. Q-Tag is outfitted with a unique pin parking hole that will reduce tagging time by up to 30%. “Parking” or connecting the pins to the tags will drastically reduce pin shortage. Q-Tag’s pin parking hole will eliminate possible injuries, as there will no longer be loose pins laying around. High definition logos, marketing, and promotional messages, security warnings, and QR codes can be printed on the top clear resin dome. For additional information about products mentioned in this release, or to learn more about ALL-TAG, please visit https://all-tag.com. ALL-TAG is a manufacturer of U.S. made 8.2 MHz Radio-Frequency (RF) EAS Labels, and supplier of Acousto Magnetic (AM) EAS labels that are used to source tag retail merchandise. ALL-TAG also supplies RF and AM Hard Tags, Ink Tags, and other Electronic Article Surveillance (EAS) solutions that are fully compatible with Checkpoint® and Sensormatic® brand products. ALL-TAG has been manufacturing its RF Labels for source-taggers and retailers throughout the world since 1992. Our manufacturing facility is located in Boca Raton, Florida. The company also has subsidiaries in the United Kingdom, Mexico City, and Hong Kong, to service our customers throughout the world. The Bar Code News (barcode.com) a top resource for the bar code industry, has released its latest issue of The Bar Code News Magazine. This free, online publication includes case studies, helpful articles. FAQ, and tips pertaining to the bar code industry. This publication is packed with insightful information from experts in the Bar Code and Labeling Industry - and of course, a link to our free bar code label makers for UPC and other bar codes and also QR codes.